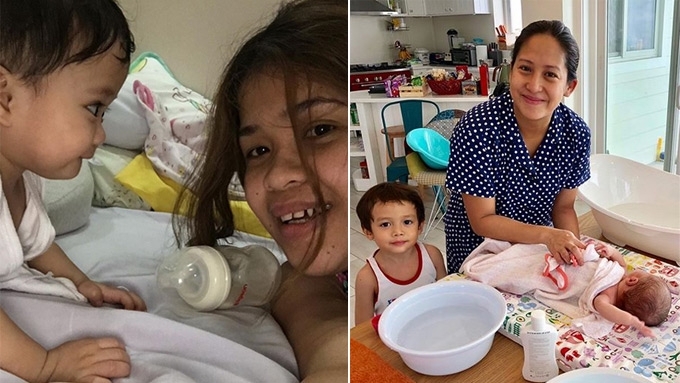 Melai Cantiveros and Jolina Magdangal both enjoy doing their mommy duties on top of their showbiz commitments. After embracing motherhood, these celebrity moms have added more household chores to their lists of things to do. On TV, they are all-glammed up, but their Instagram feeds intermittently show their no-makeup look and domesticated side. Here they are facing the challenges with both grit and grace. JUDY ANN SANTOS is a superstar in showbiz, but at home, she is the Reyna ng Kusina. The mom of three kids doesn't mind waking up as early as 3 a.m. to prepare the baon and food of Yohan, Lucho, and Luna. She also enjoys going to palengke and supermarkets. JENNICA GARCIA-UYTINGCO has not yet "mastered the new rhythm" after giving birth to her second daughter last June 25. Among her concerns last month were the dripping gripo in the banyo and the need to install window screens so mosquitoes won't be able to go through. MELAI CANTIVEROS-FRANCSICO considers cleaning the toilet her "morning exercise." She and husband Jason Francisco decided not to hire a nanny, and came up with a routine based on their schedules. JOLINA MAGDANGAL-ESCUETA brings her son Pele to school, and chronicles special occasions such as Linggo ng Wika. The Magandang Buhay host also does her wifey duties, such as shampooing her husband Mark Escueta's hair, with a song and dance number. Indeed, the only secret to becoming a super mom is loving your role.